Do you work for Wave? The world's fastest growing small business accounting software. Learning about Wave? We can help. "How easy it makes everything"
"A good online accounting platform with just about all of our needs"
The user interface of Wave is very clean with distinct menu options and sections that make navigating the platform fairly simple. Most all of the tools are self-explanatory enough for most of us to go in and use it without needing extensive training. We can create engaging data-filled reports within seconds with Wave's custom report generation tools. We not only have all the tools we need for standard accounting and tax purposes, but we can also generate invoices and connect all of our bank and credit card accounts to transfer payment information completely online. I think the fees for accepting payments online is slightly too high. We only use that feature once in a while since we can get better rates through other methods. Being an online-based accounting platform puts some security risk into the equation. We never know if Wave will get breached or if our passwords will get stolen. Wave is used by many and should be considered a trusted company for your accounting. Though there's a risk involved with processing financial information online, as long as you take the proper and obvious precautionary measures, such as securing your passwords, you most likely will be fine. I handle many aspects of business and use Wave as my main accounting platform to manage payroll, expenses, reports and other accounting tasks. Rather than depending completely on accounting specialists, we can use Wave to run most of our accounting activities and manage our spending very efficiently. Overall, Wave has been a dependable and error-free online accounting platform that we can count on for immediate and accurate account updates. "Great for those with little accounting knowledge"
Wave is relatively easy to setup and use. There are some great features that are time saving. The ability to create recurring invoices. The integration with Stripe for payment options. And, I can easily connect with my bank accounts for reporting. It's the perfect solution for small businesses - most likely bigger businesses as well but I can only recommend based on small business. The initial setup and learning curve was a bit time consuming but I had very little knowledge of accounting so took me longer. For those who have used other platforms it should be a breeze. For those looking for a simple, secure option with loads of features and excellent integration with payment gateways then this product should be trialed. I can have all of my clients information, history and invoices in one place to easily find and reconcile when needed. I can create recurring invoices to save time. I can see what cash on hand I have. Reporting is great for tax time. "An Invoice And Estimate App Small Business Must Be Using"
Wave is an invoice, estimate and accounting software in the cloud. I like that this app has all you need in order to manage your small business in terms of accounting. We are a small web design company in Colombia. At this moment we mainly use the app for create estimates and invoices, but in the future we are planning to start using the accounting part. Although the software is focus on English language users, the app allows you to translate some terms to Spanish, as it is our case, because we are in Colombia. 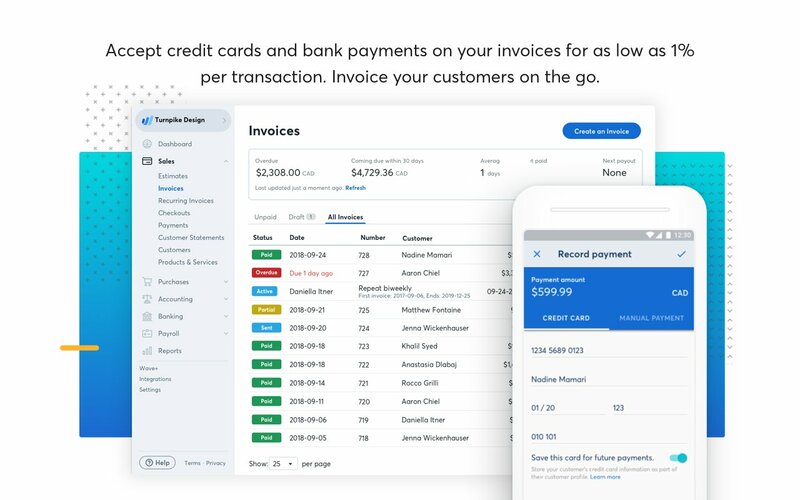 One thing most small business users value is that this software is free, completely free for all users, with no limits in amount of invoices and estimates. Very cool. Wave wins money because they charge a small fee when you accept payments online. Although the software allows you to translate terms to Spanish, it is no possible to translate all the terms. Terms like "Bill To", "Invoice Number", "Invoice Date", "Payment Due" and others are no allowed to translate to Spanish, so our estimates and invoices go that way. No so cool. Other thing we don't like is that the app has very limited capabilities in order to customize invoices and estimates.templates. There are three templates and no more. No styling. Absolute positive. If you need to create estimates and invoices for your small business, then use Wave. If you as a small business owner need to create estimates and invoices (who don't) for you products and services, and need a small accounting software, then Wave is the tool to use. 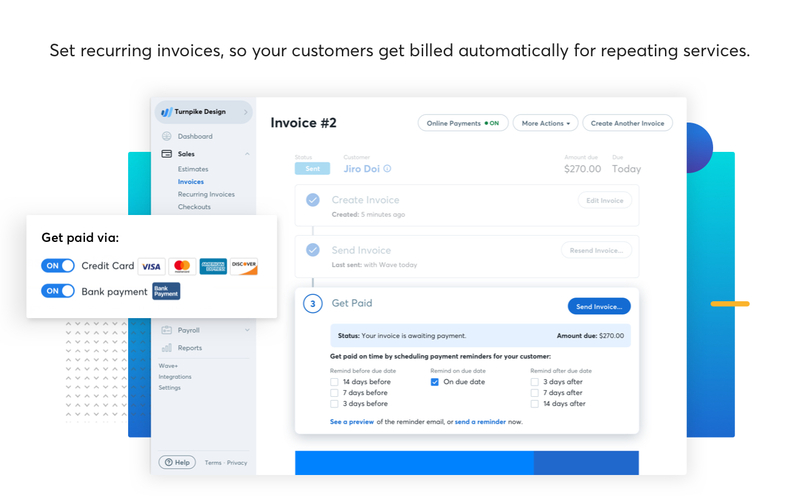 Before Wave we were using Invoice Ninja and others, but, without a doubt, Wave is the best tool, because its features and cost (free). Wave is free! It's got mobile apps that make it easy for me to scan in a receipt or send out an invoice from my phone. It's easy to use, and has a vibrant community waiting to help. The downside? I guess, a downside is that it doesn't tie in to Mint, but even for that, I'm not switching to QuickBooks. Although a bookkeeper friend has suggested that I take a look at QB desktop version, so I will. If your accountant wants you to pay for QB, tell 'em to get Wave instead. Wave makes it easy for me to be a one-man show. I can easily track my income and expenses, assets and liabilities while I manage my website, create my own marketing material and run the one-man sales team! I really like that I can set up recurring invoices for my monthly clients, and that the invoices ship out on the correct day ensuring that I get paid in a timely manner. I also enjoy the monthly expenditure tracking that is included in this web app. Sometimes the history for a specific client is difficult to target, especially when someone wants to see their yearly expenses with me. This is a great accounting application (AND it works with the Station app!!) for small business. It is very flexible until you link a bank account that is not your primary account for business income and expenses. I would definitely only link it to your business account, and not one that is used for other purposes. I had to reset mine this year because it got a little confused between my personal and business accounts. I'm certain it was operator error, and I did not utilize their help feature before that. Aside from that, Wave has been working flawlessly, and I do recommend it for small business. I primarily use Wave for all of my small contracts for design work, and all of my larger monthly retainers. Giving my clients an option to view their invoices and make payments online is a serious bonus. Also, keeping track of expenses vs. income is an important part of running a small business. Wave has not let me down yet! "Wave is an amazing service for businesses on a budget"
Remember that the product is free and how much money you are saving on a monthly basis. "Everything I need for my small business accounting- and more!" 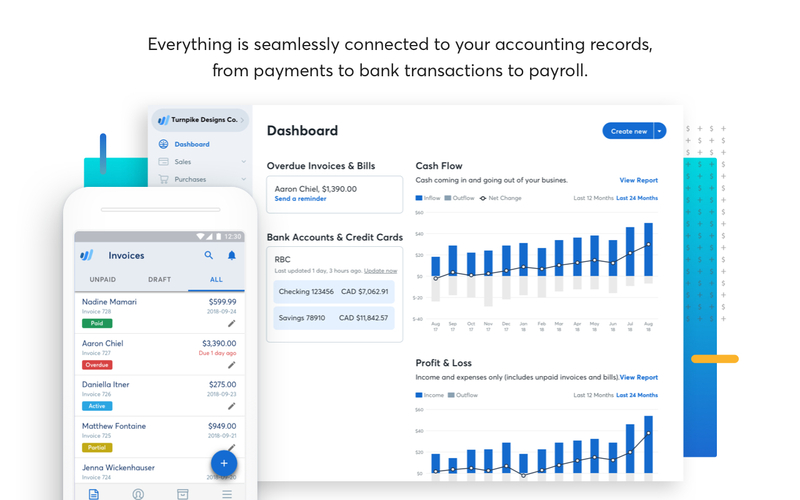 Wave is a comprehensive accounting app that is easy to use, has great features, and is most importantly- completely free! It is all online, so it allows me to access my account anywhere from any device, which is very helpful when I am travelling or when I forget to bring my laptop to work. I have previously used QuickBooks Small Business, and Wave is completely comparable in my opinion- except for the monthly subscription fee! It allows me to run multiple kinds of reports, integrate with my bank and credit card accounts, and reconcile all expenses and income seamlessly. The only downside is that Wave doesn't have a comprehensive mobile app available, at least for Android. Wave does have supplementary apps, like an app that allows you to upload and categorize receipts, which then integrate into the main Wave interface. However, it would be great if there was an app that allowed for more on-the-go accounting. Do it! I have no complaints! I am able to easily reconcile my business accounts any time, anywhere. I can also quickly run reports to help with my financial planning. My accountant also loves Wave and has no preference between it and Quickbooks for everything that she needs to use it for! "I can save customer profiles and they can save their payment info for auto billing." I love that I am able to save customers profiles and their billing information for easier future services. It is the little things like that help speed up processing time for customers. Every little bit helps. I like that it shows the invoices that are overdue separately making it easier to keep track of. There is nothing I dislike about Wave. I love using it. Very user friendly. I love that it keeps track of overdue payments. I also love that it keeps track of when the last time an invoice was sent and the last time a reminder was sent as well. That is another thing I love. I like that you are able to easily send reminders to customers for over payments. Keeping track of receipts is easier thanks to wave. "A free alternative to Quickbooks"
Wave is free to use unless you add on payroll or bookkeeping support. It's simple to use, allows you to invoice and accept payments, and gets the painstaking job of accounting done efficiently. The user interface is not too exciting and invoicing design is limited. Wave is a great accounting service to use for your small business. It's robust and plenty capable. If you're tied into the Quickbooks ecosystem you may not transition well but if you are starting fresh Wave is a great alternative to the Quickbooks giant. Wave allows me to manage my accounting and accept payments from clients at virtually no cost outside of a payment processing fee which is close to industry standard. 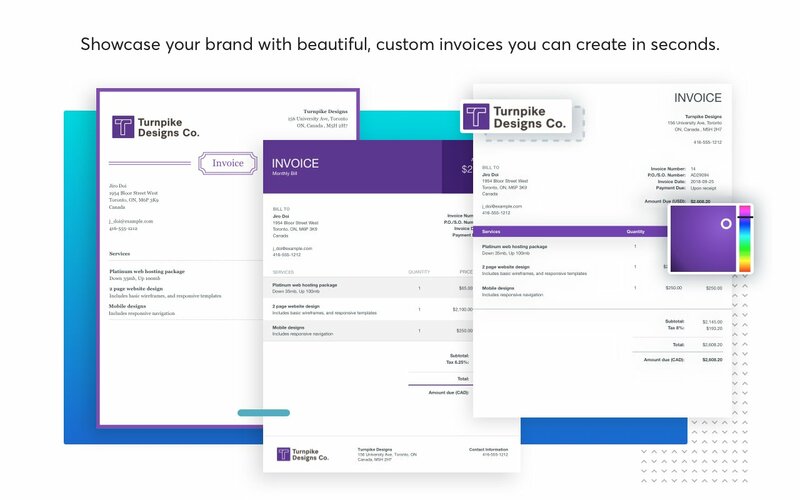 "Best (Free) hosted software for invoicing and account "
Simple invoicing for small businesses and its hosted so it seeks the ease of small businesses for developing a invoice software and hosting that. its quite simple and easy to use for a normal employee with sort-cut popups. Employee payroll is not available in indian currency. Also most of the things can not be deleted, like configured taxes ( It may be because of dependency ) as tax configurations been used for existing invoices. If need is accounting software you can go with wave it gives good customization options for startups. I remember wave got started as a invoicing software and we have started just for invoicing and now its a accounting software. We are now using for invoicing and tracking records of payments. It solved a problem of developing a software and managing all taking care by wave. 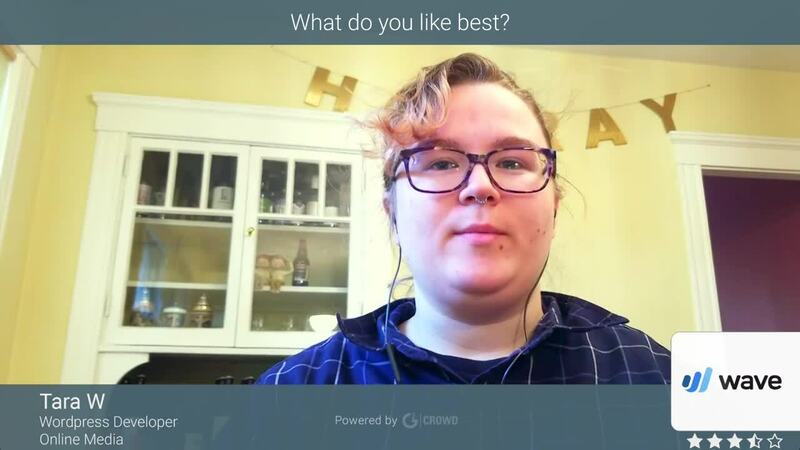 "Wave Apps is the most important service I use for my business"
My favorite thing about Wave is that you can see at a glance how your business is doing, and compare it to last year. I've tried other accounting software and they don't come close to the information Wave gives you. I can't think of anything I don't like about Wave. It checks all the boxes I need to run my business AND it has features I don't need yet but will as my business grows. There is literally no downside to trying Wave, it's 100% free to use all the features, no trial, no tiered packages. Their paid version is exactly the same, except you get priority support. You can also pay for a Payroll service for $24/month, which I think is more than fair. Wave has transformed my business and I look even more professional because of their billing options. I can set my clients up with any type of billing schedule they like just like a larger company could and it's all automated! The major problem I'm solving is having my books organized for FREE. Not only is it accounting software, the invoicing is amazing. I no longer need an invoicing software and an accounting software. "Great for new and experienced businesses"
I like that Wave doesn't have overwhelming reporting and editing features. A lot of the times when you log into accounting programs it can seem overwhelming. Not with Wave, it's pretty easy with a little bit of help from some tutorials. I also like that I can send invoices and utilize the ACH feature which makes getting paid easy. Bonus points also to the new rebrand! Honestly nothing I love that its free! Definitely think its worth a try! Definitely check it out you can start an account for free and test it out with your business. They even offer payroll options. Getting my finances in order especially when I use multiple accounts its easy to tag and write notes inside of Wave for each transaction! "Perfect for my Small Business"
For my needs, Quickbooks is too expensive and complex. Wave has all the features I need without being overloaded. Plus, it's free! I was using Excel, and my small business quickly grew out of that. Shopping around, I was glad to find a free, feature-light version of accounting software. Customer support has been very fast and friendly. Much better than my past experience with more expensive products. Any questions or speed bumps in the learning curve were answered quickly. There is a learning curve to entering everything (like the date format). But once I got going, it's been great. I was so glad to have found this free, easy product for my bookkeeping needs. I did use a couple of online tutorials from YouTube (not made by Wave) to learn to set up my bookkeeping. It also gave me the idea that there are lots of capable people using the product, so I saw this as a good thing. I was using excel for all of my accounting. Wave's categories, reports and monthly reconciliation are a blessing! I've cut my accounting from 1-2 days a month to just a few hours. I love that this app is free! If you want to receive payments through the app there is a fee, but for keeping track of income and expenses, it's free, which is all I need as a small freelancer. Uploading a receipt takes a long time to process (like I've always given up on waiting and the next time I come back it's finally there). And I can't edit/enter any of the receipt into until it's done processing. So that's annoying. If you're just starting out or have a small operation, this is a good starting place! The software I was using to track my expenses before was on a hard disk download, but I didn't buy an upgrade every year and the last time I updated my computer, the software started crashing on me. So I needed to either upgrade or switch to something else. I didn't want to invest a lot of money in tracking my expenses, but wanted something that would keep track and save time with sending invoices. Wave seems to be doing both. The price tag can't be beat. You only pay to process payments or payroll. If you don't need either service it's 100% free to use. It has all of the basic features that a freelance or a small service-based business needs. You are able to have multiple companies and unlimited collaborators. The product is constantly being improved as I see offers to beta test new features and have benefited from several new features released during the years that I have been using it. Upselling advertising that you can't get rid off, while it's unobtrusive and they have to make money somehow, I wish that I could hide it after a while. Customer support is very friendly and usually useful but only available via e-mail or chat so if you have an urgent concern there is no phone number to call. You don't lose anything by trying it. Cost for payment processing and payroll is competitive, everything else is free. If you need inventory tracking, purchase orders, credit memos or class tracking, this isn't the product for you. I used it when my business first started and I didn't have the funds for a paid service, I was so pleased with it that I kept using over the years and have helped clients implement it. Invoicing is easy, aesthetic and online payments are great and low-cost. It's very easy to configure recurring invoices and automatic payements. Recommendating wave is a pleasure, this is the best for all that have to be with with accounting, billings, invoicing, payroll and more literally you won't need anything else in the administration part, just wave. "A flawless invoicing system with great reports to help my end of year tax return." The freemium pricing model. It's free to use the system, the only charge being if you want to accept payments by card which isn't something that I do with my business model. As I'm only accepting payments in cash/cheque/bank transfer, I don't actually pay any fees to Wave. As someone in the UK, I also rely on Wave to give me my end of year income figures for Self Assessment - great reporting tools. I really can't find any fault with Wave and I've been using it for years, including through a period that involved an update to the look and feel of the platform. I guess it's a shame that the integrations rely so heavily on Zapier rather than a free service like IFTTT or even a API for connecting with other services. I very much recommend having an accountant professional or someone trained in accounts to set Wave up for you at the start. From a layman's point of view, Wave is very easy to set up, to link to your bank account, customise invoices etc but I think it's best to have someone "hold your hand" at the start so that you can be sure you're working correctly from then on. Of course, if you do it all right at the start then you'll save money when your accountant has to work less hours at the end of the year to reconcile everything! No more invoicing spreadsheets and word documents to work with! No random folders on my computer filled with individual invoices that I've sent out! "Great, simple, and perfect for small businesses"
The interface could be improved slightly as well as some of the templates could allow for more customization. But overall this is a great software to use for free. Can't complain really. Definitely the best software for the cost. Even with the the additional costs, it's still the best software I've found for small business owners. I looked at a lot of the big brand softwares that cost hundreds of dollars. But if you're providing consultancy services or working independently and just need to invoice folks from time to time each month, this a great alternative to using google docs or some word template. It reminds me of invoices overdue and remembers names, addresses, etc. Invoicing and trying to keep on top of it! "Software wave the best I used"
Wave is awesome, the best wave is for free on what I need. And it gather just in one screen many options for administrating a company. just great to have wave in my company. I recommend wave with my eyes close, Invoicing, billings, profits, overdue payment, I mean have everything just in one place. Since I have wave the only thing I can think about is organization, my business is more organized, the bills are great and it looks very pretty. "Wave makes sending invoices and collecting payments simple"
I'm a fairly new user of Wave. I use it to send invoices to my clients. I found it to be very simple to use, the interface is nice and setting up different types of payment collection was easy. I'm currently on the free plan since my needs are limited. I was surprised that they offered credit card payments for invoicing on the free plan. I couldn't find other software that allowed me to take cc payments without signing up for a paid plan. The only thing I don't like it having to pay a credit card processing fee when my client pays by credit card. That's not necessarily the fault of Wave though. Try out their free plan to test their software. Wave makes it possible for me to handle my own client invoicing. The benefits are streamlined payments from my clients. "There Are Probably Better Options Out There, But This Is Free"
I like the recurring invoices best, but even this could be improved. I have to wait for Wave's set time to see them reoccur instead of immediately after midnight on the date they are to recur. I absolutely detest that if a customer overpays an invoice, it doesn't really keep track automatically and apply the overpayment to the next invoice that the customer receives. There are workarounds for some things, but these are not always very handy. I also do not like that it is difficult to create your own accounts, for example, a separate "Gas" and "Electricity" expense account. There are some ways to create new accounts, but it's awkward, in my opinion. Give it a try, you might like it. I like that it is free. But there are probably better options out there. I use Linux for my desktop, and unfortunately, there are not a lot of accounting/book keeping applications for Linux. There is one that I used to use and really liked called Quasar, but unfortunately it won't run on some newer distributions. So Wave solves that problem for me in that I can continue to use Linux and have some of the features I want in an accounting app. "The best and easiest accounting and invoice tool ever"
This tool has made it possible to operate very efficiently when managing my accounting and invoicing needs. I can login via Google Auth and link bank accounts (inluding Paypal & others) to import transactions. All I have to do is go in periodically and label the transactions (expenses/income etc..) and it will perform reporting for me. My quarterly sales tax and annual taxes are a breeze. Also, I use this to invoice customers & when they pay - it imports those income deposits so it's all centralized. I can save customer profiles and they can save their payment info for auto billing. Customer service is very responsive to all inquiries. They also have a payroll service available. The only thing I wish I could do is null out the remaining balances on partially paid invoices without deleting the invoices if I choose to waive the remaining balance. Also - this is not a dislike but rather a feature wish - it would be magical if it integrated with more productivity tools. This is an all-in-one solution. I highly recommend to others looking for something for their business. I am able to have a centralized place for my accounting and invoicing that didn't take an arduous set up time. It was very user intuitive and make corrections as I go along and learn more about accounting best practices. "Awesome for small businesses - and free!" I love the simplicity and ease of use. The online platform is easy to navigate, and provides all the features that small business owners need such as client contact management, invoicing, payments, and more. You can connect to your email (to import contacts) and to your bank account as well (for automatic reconciliation and identifying type of purchase). Best of all - it's free! Wave previously did not have a feature that was conducive to typing purchase orders. However, just within the past week alone Wave issued multiple updates and upgraded from their original platform. They now allow for a PO number to be entered on an invoice, however I don't believe this program is as intuitive if you needed to type POs as a large part of your business. I also am currently not sure what accountants think about this program (my accountant recommended Quickbooks) and how they will be able to navigate and pull the information needed for filing taxes. I also dislike how sometimes payments are recorded twice (by marking a payment on an invoice, and by having a bank deposit) - you have to manually go through and delete your bank deposit which can be cumbersome and confusing. Try it! You really don't have anything to lose and may prove to be exactly what a small business owner needs without having to pay big dollars for fancy book keeping software. I am much more organized and able to easily track status of payments and invoices out to customers. I can even set automatic recurring reminders and receipts - which saves so much time! Clients can pay outside of the software, but there also are options to pay via credit card (2.9% fee - which is better than Square's rate I believe), or bank transfer (1% fee). I realized that this software is perfect for small businesses and SO awesome that it's free. I'm going to continue utilizing this program until (and if) my business ever outgrows it. I like the invoice feature the best. I first got the software to send clean invoices for payment as my other project management software charged me more for more invoices. I'm still trying to figure out the bookkeeping section. It's not as clean cut as other providers I have used so I'm hoping to utilize it more to have all my bookkeeping in one place. Since small businesses are their primary focus I think they should add more features for freelancers. It would be great to use it as a tool to project my taxes for the quarter. I pay for Quickbooks for this but would definitely switch to Wave for this. I am trying to solve issues with invoicing. I want to not have to pay to manage my finances and my client's payments so this has definitely helped me with that. A benefit I have realized is accepting online payments straight through the system. I just use this for smaller projects because I don't want to pay more fees. I'm really excited about their new auto payment feature as well so I hope I can use that soon. I love how easy it is to use Wave Accounting. Even though I have a background in Accounting this product is easy to use for someone without much accounting knowledge. It is very easy to add a bank so that your financial data is synced with Wave. Honestly I haven't found anything that I dislike about Wave. If you are looking for a cost effective way to get your accounting done then this product is it. It is very easy to use and get paid using their invoice service. It is a great product plus you can download the invoicing app to your phone to track payments. It allows us to track revenue and expense easily. We can also send an invoice with ease to customers. Wave allows me to keep track of my entire 'business'. I can send invoices, accept payment, know my financial status and so much more at the click of a mouse. I can connect and see what's happening with all my accounts. I honestly couldn't do without it. I haven't discovered anything I don't really like yet. So far everything it does works for me. I will see how that goes once my work picks up more though. Whether you're just getting started or already in the know, consider utilizing Wave. As a freelancer or Independent Contractor you need to be on top of your money at all times, and Wave enables you to do just that. Don't miss out trying other products. I did, and they didn't work like I needed. It solves the problem of having to use many different methods, apps, software, programs to keep up with my business. "A very easy to use accounting software; and it's FREE! :)"
Not having to pay a monthly charge for accounting software has been great. I switched from QuickBooks Online after I learned for what I needed Wave did just that and better. It's ease of use was not matched by QuickBooks online. Also, it can take credit cards w/o the monthly fees like QuickBooks. Nothing at this time. They have evolved over the years and I love it. They have a service line for phone calls, you an turn it on and off when you need it, it is great. I used it for 2 calls and i was well worth it. Looking for an inexpensive accounting software to bill clients, creating reoccurring invoices, and also taking credit cards. "Just started, but it looks good!" What I like about Wave most is that it is free and you can *actually* use the free version. If I end up sticking with it now, I'll definitely support Wave in the future. But it is so nice to see a free product that is actually usable and not so bogged down with constant pop-up advertisements to upgrade to the paid version. Also, the design is simple and functional. The first time I looked at Quickbooks I was totally overwhelmed, but Wave almost looks like any other financial platform I use. I think it would be nice if there were more resources on how to set up a bookkeeping system. If you're not yet paying a bookkeeper it is probably because you're just starting your first business, which means you don't know much yet. Just a walk through of basic principles and how they're realized in Wave would be nice. Before wave I was using a pretty complicated system of Excel sheets; Wave simplifies and unifies everything. "Great system for any company!" Wave is so easy to use and best of all it is free to use. I can track my invoices, payments, payroll etc. Invoices can be customized to your liking and you can get paid with a debit card or bank account with a low processing fee. The best thing that ever happens to my company. It takes some time to customize your account to fit your needs and there is a lot of verification when it comes to payroll. But it is all worth it in the end. I recommend Wave to anyone who handles all finances on your own. It is easy to use and takes minutes to get paid. The problems I am solving with Wave is my payment processor. Before using Wave I sent invoices manually and the entire process was a long one for my clients. Now that I am using Wave I close more deals and my clients are happy. "Great product for early companies! " The simple nature of this program makes accounting almost enjoyable. The best part about this product is the fact that you can pretty much do almost anything with it in a simple and fast way. From basic book keeping to setting up your payroll, it can do it all. That is what I love most about this product. It is also very user friendly so almost anyone, even someone who is not tech savy should be able to use it with no issues. There is not much not to like about this product other than the task itself. I would definitely use this product especially if you are new to accounting. I had to set up accounting software to keep track of expenses and revenue for a couple businesses. "Horrible customer service and support"
The system was easy to learn and intuitive. It was all going great until I needed customer support after ALL of the information I had been inputting for days was inaccessible. Support never contacted me after an initial basic email. They ignored my requests for help for days. Horrible customer support. I spent days inputting information - was bumped out of the system - went to sign back in and it wouldn't recognize me - when I was able to sign back in all of my info was lost - every. single. piece. I contacted customer support and they told me to reset my password (which I did) and have completely ignored me since. I've contacted them at least 4 additional times requesting some support and help. I've wasted at least 40 man hours on inputting and then losing and then trying to regain the info. I also have had to re-do everything in another program. I also wasted a bunch of money meeting with my accountant because the program lost my information. Beyond frustrating. I couldn't trust this product or recommend this product after my experience. I don't think I've ever received such horrible support for a product. Avoid this product. You risk losing all of your hard work. If you need help, they will ignore you. This is a FREE bookkepping tool. I use this and quick books depending on my clients needs and I like the ease of it. Customer Service is also good. It was not very user friendly in the beginning it did take some time to get use to it. Once you figure it out, its pretty good. Be Patient, watch a few tutorials if you need to. Once you learn it, its easy to use. It saves money this is a good tool to use especially if you are just getting started in your business. For a free service, the application was very professional-looking, feature dense, and easy to use. I was grateful to find this when first starting out my business, and didn't have a lot of capital to invest in setting up my administrative structure. I really like the design, and the color-coded ability to see which invoices have been paid / sent / unpaid. It is so easy, and took me hardly any time to set it up and get use to using it. I ultimately stopped using Wave because I wanted to save myself time by combining multiple features within my invoicing system – the ability to sign contracts, create proposals, manage incoming leads, etc. But there is actually a lot I miss about Wave now, because it's so good at the one service it does provide! This software is great for keeping your business finances organized. Wave helped my business look more professional by having a consistent invoicing system, and the ability to accept credit card payments by emailing a client. Wave really helped me when it came around to tax time with the "Reports" feature – I could just go into the financial reporting, categorized my business expenses, and make sure all the totals were accurate with what I put on my taxes. "Great platform at no cost"
Wave does literally everything we were looking for at no base cost. We are able to keep everything we do in one place instead of having to have multiple programs. I wish you could schedule jobs or create an appointment inside of your program. This would make it easy to take a payment once you are on site. We are able to create invoices and estimates that look professional without having to put our customer database inside of another program. "Free and easy to use." I like that it is free yet still customizable. I have not found another program that allows me to customize the categorization options. I also like that I am now able to connect my bank account. Before I could connect my bank account it was pretty tedious. There have also been some improvements in the amount of time it took to transition between entries. It used to take several seconds to save a new entry and move on to the next. Use it to categorize and track expenses. "Simplest system to keep track of expenses"
Ease of use; the general ledger of adding expenses/income. Provides you with a breakdown of what type of expenses are available as well as allowing you to create your own. Can take expenses off of cash on hand value! Many reports available to help you get a better idea of where your expenses lie. I have yet to use the Payroll feature as we have no employees; but the ease of use is what turned me on the most to this program. The fact that this program is of zero cost also aided in me choosing this over similar programs on the market. Nothing to dislike- using this program is so simple. I did not even have to follow any type of tutorial and was able to figure it out on my own in about ten minutes. The navigation pain is self explanatory and the number of features available surpasses any other system I have used (concur, Quickbooks, etc). Love using this program- I find it a lot easier to navigate than Quickbooks! Wave accounting has allowed me to better track my business expenses for both of my LLCs. I use the transactions tool bar to allocate expenses for each of my LLcs which allows me to breakdown for my accountant where/what I am spending the most money on. "A great, free solution for accounting"
I'm a fan of "cloud accounting" for the convenience, and the Wave app offers this solution as well as a 'Receipts' app that really helps with logging expenses on the go. Most importantly, there's no price tag to use this solution so it's easy to overlook any of the cons for the most important reason. Free is the best pro of all! Unfortunately, there is no option for time tracking. 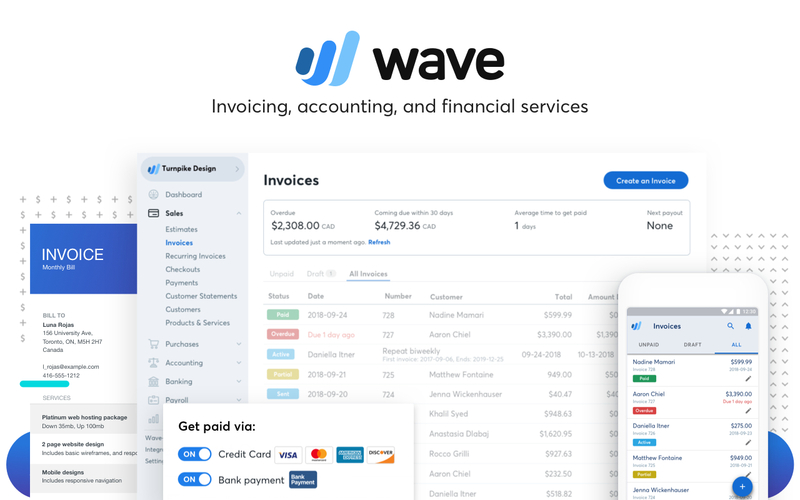 I fell in love with Wave after using it to set up my second business, and was hoping to move my first business over from Freshbooks (to save $30/month) but it just wasn't as intuitive or easy to set up for a freelance services business. Like most other accounting solutions, it's much easier to set up for a "physical product" type business and, again, it's free so I can't complain... but I do wish it would offer more of the same benefits available with Freshbooks for a service provider. It's free so it doesn't cost anything to set up and see how 'it feels' for you. Simple accounting. Best benefit is that it's free and somewhat easy to set up, for certain business models. "Great for the Cash Strapped Start Up"
The interface is very intuitive. It's easy for a new entrepreneur to keep their books and process payments while sticking to a budget. It's free to begin, with no monthly expenses beyond just my credit card processing fees. I wish I was able to tweak the overdue invoice follow-up emails a little more. The graphics in each email are unchangeable as far as I can tell. It would also be nice if less emphasis was placed on clients to make their payment via credit card, but it makes sense that it's the only way Wave makes money. I'm able to keep accurate books as a sole proprietor. I'm also able to show a professional face to clients with their easy invoicing feature and credit card processing.